Precieux’s first contact with Palace for Life Foundation was in 2013, when he attended a community football session at Selhurst Park aged 13. Three years later, the self-confessed ‘trouble child’ found boxing and his whole life changed. At 16, Precieux was kicked out of sixth form and was targeted by an older gang member. He was used by the gang as a ‘county lines’ drug dealer and got involved in trafficking drugs to rural towns and cities. Having delivered cocaine and heroin to areas including Bournemouth, Ashford and Kent for the gang, Precieux was threatened at knife point by a rival gang. In an attempt to take himself away from this situation, Precieux joined Croydon Amateur Boxing Club, where he met Adam Ballard, founder of Gloves not Gunz, a community organisation that aims to tackle youth crime and violence. Meeting weekly in Norbury Park, the group gives young people a free fitness class, followed by a mentoring session on important issues such as gangs, weapons awareness and healthy relationships. After his involvement, Precieux wanted to give back to his community and volunteer with the group to help other young people in the same situation. However, at first Precieux would often struggle to turn up on time and was disorganised, which affected his preparation for the sessions. The Foundation and Gloves not Gunz staff worked with Precieux to help him understand the importance of being a role model and setting good examples for young people and he soon adopted a more professional approach; turning up before the session with everything he needed. 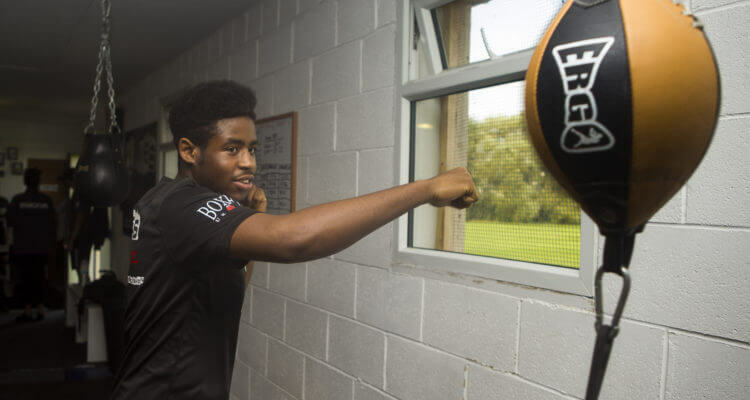 Five years after attending his first community football session, Precieux completed his boxing activator qualification in February 2018, and noticing the improvements he had made in his commitment, mentality and confidence, Gloves not Gunz rewarded him with a job as the organisation’s first Youth Mentor. Precieux is now one of the coaches delivering the Palace for Life Foundation community boxing programme in partnership with Gloves not Gunz, and is also running boxing sessions at local schools to help tackle issues like youth violence. In the future, he is looking to gain a Level One qualification in boxing, which would allow him to work in boxers’ corners at fights and conduct sparring sessions, and he also has ambitions to box. To help the Foundation make a difference to the lives of more young people like Precieux.